Essentially an internal representation is created when we re-present the outside world to ourselves internally. We take information in through our senses and we make internal representations (NLP – terminology) of what we take in. 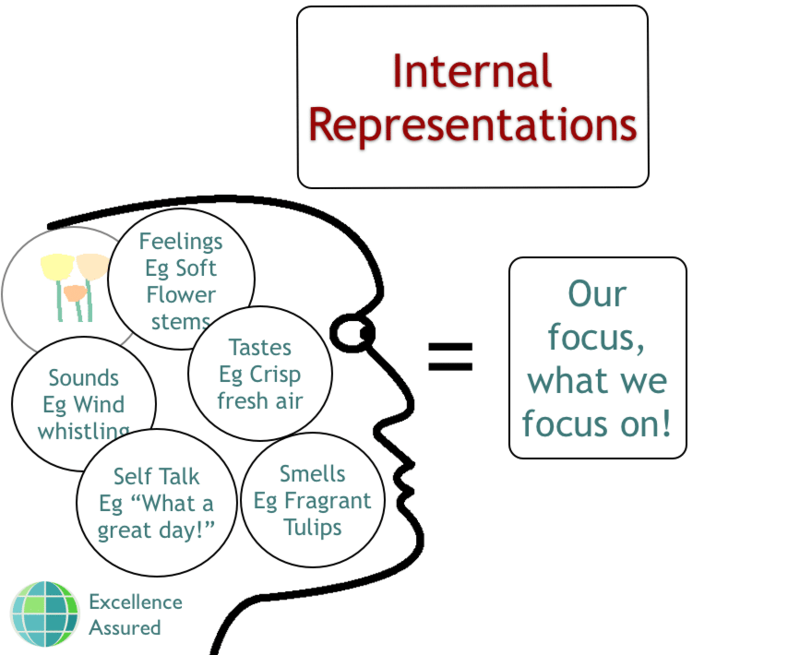 The internal representations that we make can consist of pictures, sounds, feelings, tastes, smells and self talk. These often present themselves to us in the form of thoughts. The internal representations that we make affect the way that we hold ourselves, our physiology, this in turn affects the way that we feel, our state. Our state affects our capabilities and so also our behaviours. One factor that is often overlooked when assessing moods and behaviour that we do not want is the unconscious filtering process that information goes through prior to our thoughts (and internal representations) being created. We filter information that we receive from the outside internally in order to try to make sense of it. This is a very detailed process and luckily for us we have a magnificent brain that does it all unconsciously for us. The internal filters that we have include beliefs, decisions, values and memories. So when we experience an event we run the information associated with this event through our internal filters and we end up with a series of internal representations. Pictures, feelings, sounds etc. These internal representations in turn form our memories of events in our life. Bear in mind that beliefs, values and memories sit inside our systems untouched by our conscious thoughts. What I mean by that is that we often do not consciously decide what beliefs, values and memories to have, we just acquire them throughout life. By this process it means that our current internal representations (the way that we are interpreting our world) are being influenced by things inside us that are out of our awareness. We all have bad days, don’t we? We can spend a day feeling really down and upset and not really know why. This is the reason. The great news is that although our internal representations and internal filters are out of our awareness it does not follow that they are out of our control! Most people think that internal representations are out of our own influence. It is true that they are created unconsciously but we can affect the type of internal representation that we get. We can create internal representations that are positive for us so that we are more likely to get what we want in life, rather than what we don’t want. Through control of our internal representations we can change our own physiology in an instant and also our state of mind, so then we can decide to get better behaviours. We can influence other peoples internal representations and therefore we can positively influence other peoples behaviours. Imagine if you are selling products or services to people, then by using your language in a specific fashion you can influence the internal representations of your customers, therefore making overcoming objections an easy process and influencing people becomes a piece of cake. If you are coaching other people, then you will know that your aim is to enable your coachee to “see their solutions” for themselves. So as a coach you use language in a specific sequence and according to a specific process which is designed to alter and influence the coaches internal representations so that they find resources within themselves that help them reach positive solutions. This can be very empowering for a coachee. Many people in trauma experience recurring internal pictures of the traumatic event that they have experienced. This maybe recurring pictures in their mind say of a loved one lying dead in their armchair. Of course, this can be very upsetting every time the picture reoccurs and to that person it would seem that there is nothing that can be done about it. However, there is. An NLP Practitioner or similar therapist is able to help stop these pictures occurring by using a process that manipulates internal representations, like the NLP swish pattern. You can learn how to do to do just that at our NLP Training and online in our NLP e-Learning programmes.